Black pepper mutton gravy is a simple and easy to make mutton gravy that is spicy, flavourful and delicious. The dominance of black pepper is felt in very spoon of the gravy and you could feel the wonderful taste of the gravy even after finishing your meal. 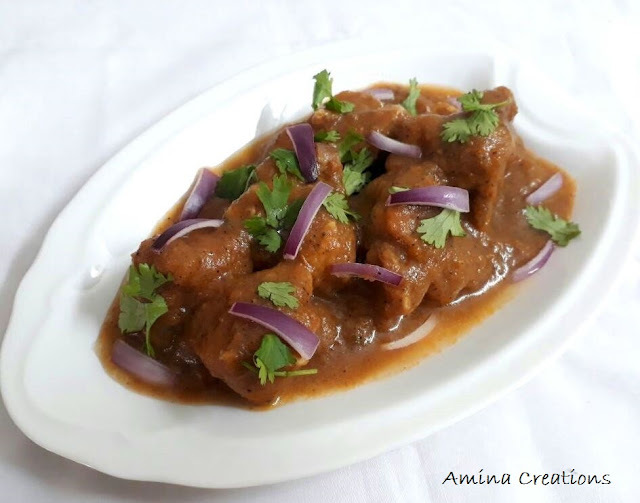 This gravy tastes best when served with chapathi or roti and is ideal for every day cooking especially during winters. Wash and clean the mutton pieces and keep ready. Take a mixer jar, add onions, tomatoes, ginger and garlic paste, cinnamon stick, stem of coriander leaves, salt and black pepper powder and grind to a fine paste. Heat oil in a pressure cooker, add the ground paste and cook for about 5 minutes (or till the raw smell goes) while stirring. Then add the mutton pieces, coriander and mint leaves and mix well. After a minute, add 1 or 1 and ½ cups water and close the lid of the pressure cooker. Pressure cook for 4 whistles or till the mutton is cooked. Once all the steam has come out, open the lid and transfer to a serving bowl.